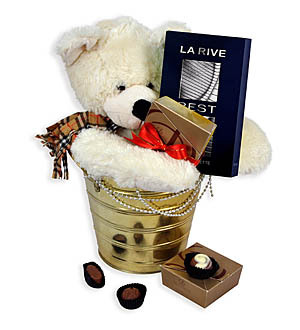 Send "love hugs" from Scotty Bear with a box of Decadence Petit Praline and a bottle of dazzling La Rive Extreme Story EDT 90ml. It features a masculine fragrance for a determined and sensual men. Top notes are Bergamot, mountain air and elemi; middle notes are lavender, cardamom, rose, geranium, peony and violet; Base notes are vetiver, patchouli, amber and leather. Next day delivery applicable for Klang Valley only. For out of Klang Valley, kindly allow 3-5 working days delivery. For more information, call 03-78830233 / 012-6915200 or sales@gift-lab.com .